About Us - Running Easy - "Try Easier"
We are quite simply ORDINARY people who have found a way to achieve EXTRAORDINARY things. 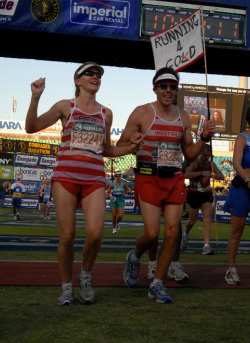 Since we discovered how to run easy, we have between us run more than 70 marathons and ultramarathons - including 21 Comrades marathons (90km/56mi). Running has become a lifestyle for us. Not something that takes all our time - we have 3 kids too - but something that fits in so easily we can do it anywhere in the world in times that suit us. Craig - Hi, I am an I.T. lecturer at a university and an international public speaker. But besides this I am a family man who loves the outdoors. I have written numerous books on everything from computers to living a healthy life. My motto is to live life fully. You can find out more about me here. Nicky - Hi, I am a stay-at-home mom who runs multiple businesses. So between caring for my family, my most important priority, and running the businesses, I also love to exercise. Since Craig and I discovered through lots of trial and error, how to run easy, I have achieved so much. Not only have I run many marathons but I've never felt so healthy and invigorated before. We would love to share our running program with you. If you would like to get started with running then click here or if you would like to aim for your first marathon, then click here.